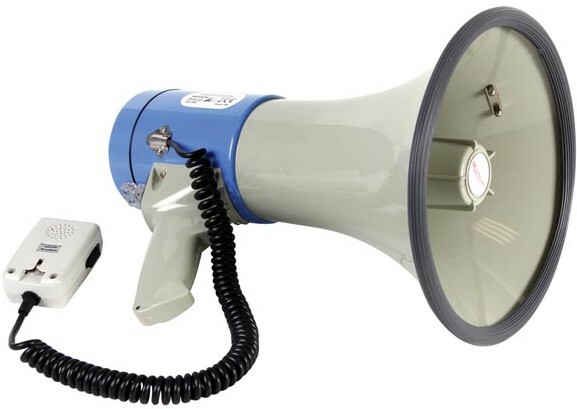 A powerful and durable megaphone suitable for all outdoor occasions. Its built-in powerful 25W amplifier and a high quality anti feedback microphone can project a clear sound between 600 - 1000m depending upon conditions. The microphone also features a handy push to talk switch and rotary volume control. Made from strong ABS with a rubber edge protector and incorporating a comfortable strong shoulder strap. A built-in siren function and comfortable pistol grip handle add to the many features. Supplied with 5m power lead, cigarette lighter plug to DC plug for external 12Vdc operation.